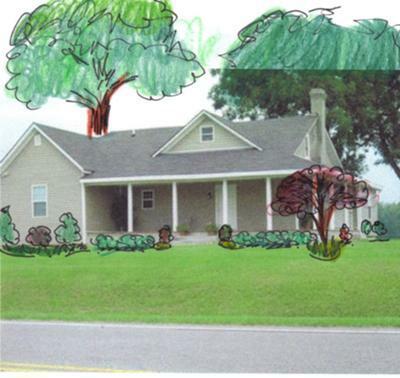 Landscape Sketch for Photo Submitted on the Ask the Expert Page. A reader submitted a photograph on the Ask the Expert page. I describe the landscaping I am recommending on that page, but wanted the reader to be able to see my suggestions. I hope this sketch is helpful. Go to Ask the Expert by pushing the button on the left towards the bottom of the table of contents. Scroll down to the submission about landscaping a front porch to see the before picture and read the description. Join in and write your own page! It's easy to do. How? Simply click here to return to Send Pictures.